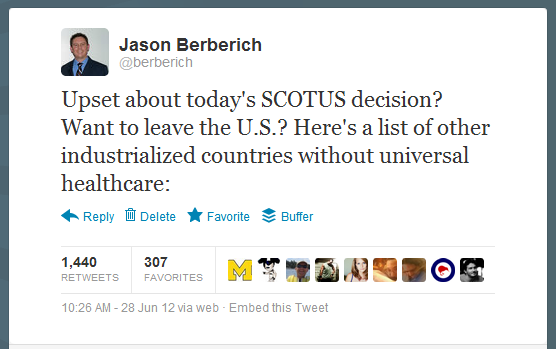 Yesterday morning I broke away from my work and turned to Twitter right around when the Supreme Court was supposed to announce their decision in the Affordable Care Act case. I, like everyone else, was surprised at the ruling, and followed-up with some instant analysis from my Twitter timeline and on MPR. I thought it was clever, and was happy to see it favorited and retweeted by several of my followers within a few minutes. I was unprepared for what happened after that. Soon, my iPhone screen was constantly on with a steady stream of people retweeting and favoriting it. When I went home for lunch, I had to plug my phone in to recharge it because the battery was getting drained from the constant notifications. Still in disbelief, I found myself constantly checking Favstar to watch the counts continue to climb. By the time I got back to the office, my tweet had 500 retweets. By 8pm, it had 1,000. As I’m typing this, the count is at 1,450. Not surprisingly, I got a lot of replies by people who didn’t get the joke, and thought I had forgot my link to the list of countries. I even had a little fun interacting with a teenager who seemed completely clueless, and heard from a small business owner who claims the ACA will put him out of business. It made for an interesting day. I’ve never interacted with so many different people in the 5.5 years I’ve been on Twitter. I’m also not expecting it to happen ever again. As best I could tell, there isn’t a single definition for what makes a country “industrialized” or “developed”. Economic criteria (e.g., GDP) are usually looked at, though human development is now often taken into consideration. 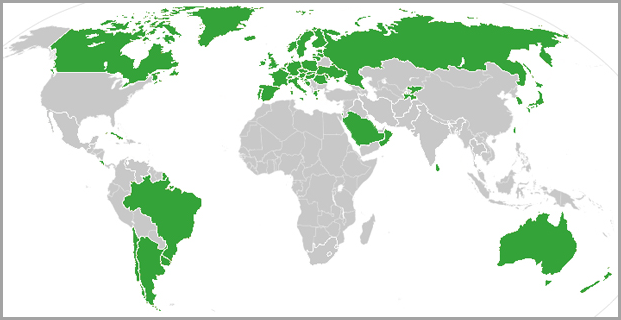 The International Monetary Fund classifies 35 nations as advanced economies, a listing that seems to the most current and representative one available. Is “universal access to healthcare insurance” the same as “universal access to healthcare”? Some would say yes, but I’m not so sure. What is clear is that the Affordable Care Act expands healthcare coverage. Hopefully it will be universal someday, and more importantly, hopefully healthcare will be, too. Getting past the word-parsing, the entire point is this: The United States is the wealthiest nation in the world, spends more on healthcare per capita than all but two countries2, yet unlike its peers, lacks universal healthcare. The ACA doesn’t get us there yet, but it’s a start.